SCIENTISTS have discovered a partially-preserved corpse that resembles a "dinosaur" with flesh still on its bones, in India. The "dinosaur" corpse was discovered in Uttarakhand, India, by an electrician cleaning out a sub-station that had been left untouched for years. The partially-preserved corpse resembles a small "dinosaur", which has baffled scientists, who are struggling to identify what it is. The creature has now been sent for analysis, including carbon dating, which will reveal its exact age. 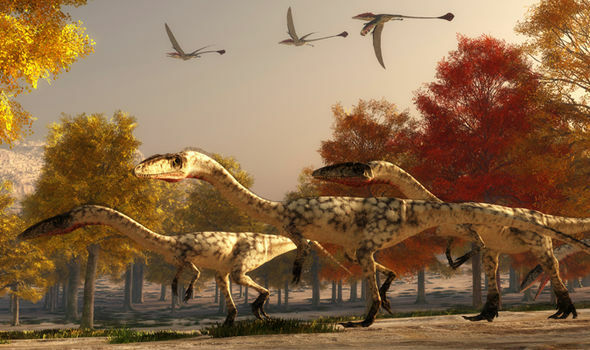 The Deinonychus, the Coelophysis and the Dromaeosaurus are dinosaurs that resemble the shape of the creature. They are all types of theropods, a suborder of dinosaur that ranges in size from a T. rex to an Anchiornis. Dr Parag Madhukar Dhakate, a conservator with the Indian Forest Service, said that the creature would remain an enigma until scientific analysis had been completed. Aaryan Kumar, a PhD student in Paleontology from Delhi University, said that it was impossible for a dinosaur skeleton to be so well preserved after so long. He said: “Non-avian dinosaurs have been extinct for the past 65 million years but it does resemble theropods, a suborder of dinosaurs which included bipedal carnivores. “But a dinosaur skeleton could not have been found in such a well-preserved condition after millions of years without it being in a fossilized state." Dr Dhakate said the specimen had now been sent to Dr Bahadur Kotlia, a paleontologist at Kumaun University, for historical analysis. 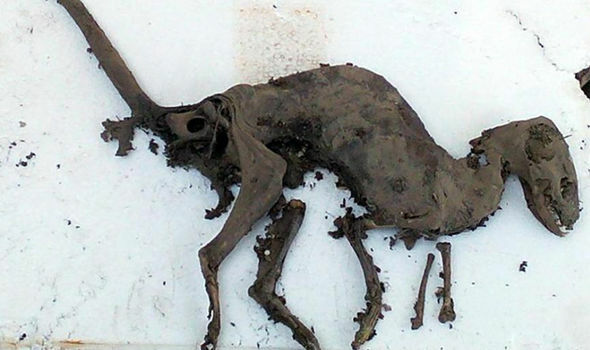 There have been suggestions that the corpse could be a distorted animal foetus from within the goat family, however, the mystery is still unsolved. Meanwhile, new research has revealed that the world’s largest dinosaur tracks were made 150 million years ago by a big beast at least 115 feet long and weighing more than 5,500 stone. The tracks were first discovered eight years ago in the French village of Plagne, in the Jura Mountains. Since then, a series of excavations at the site has uncovered other tracks, sprawling over more than 150 metres (492 feet). They form the longest sauropod trackway ever to be found. Now, having compiled and analysed the collected data, French scientists have concluded the tracks were left 150 million years ago by a giant dinosaur at least 35 metres in length and weighing no less than 35 tonnes. Following the discovery of the tracks in 2009, researchers from the Laboratoire de Geologie de Lyon supervised digs at the site, a meadow covering three hectares. Their work unearthed many more dinosaur footprints and trackways. It turned out the prints found in 2009 are part of a 110-step trackway that extends over 155 metres world record for sauropods, which were the largest of the dinosaurs. Dating of the limestone layers reveals that the trackway was formed 150 million years ago, during the Early Tithonian Age of the Jurassic Period.